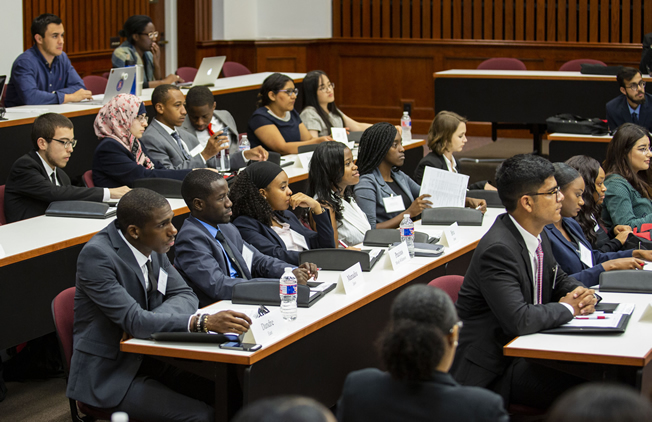 The next group of Pre-Law Pipeline Program students will begin their introduction to legal education on May 28 at the University of Houston Law Center. Jan. 17, 2019 — The University of Houston Law Center's Pre-Law Pipeline Program will be honored Jan. 25 by the American Bar Association's Council for Diversity in the Education Pipeline for its efforts on behalf of diversity in the legal profession. The Raymond Pace and Sadie Tanner Mossell Alexander Award for Excellence in Pipeline Diversity will be presented at the ABA Midyear Meeting in Las Vegas. "I am very excited that the Law Center is being recognized with the Alexander Award," Dean Leonard M. Baynes said. "This Award provides the Good Housekeeping Seal of Approval to the work of the pipeline program. Our efforts have achieved phenomenal results with median LSAT increase of 12 points, and the vast majority of the participants go off the law school. It feels great to be recognized for our effort. "Kristen Guiseppi and Professor Meredith Duncan do an outstanding job in administering the program." The Pipeline Program, which will welcome its fifth class in the summer, was established by Law Center Dean Leonard M. Baynes and Program Director Kristen Guiseppi. Professor Meredith J. Duncan, director of Metropolitan Programs, oversees the program. "We are humbled and honored to receive this prestigious award from the ABA," Guiseppi said. "We are thrilled that our pipeline efforts are positively impacting the diversity landscape of the legal profession, providing opportunity for our students, and are being nationally recognized." The Pipeline Program has been recognized by INSIGHT Into Diversity Magazine with the Higher Education Excellence in Diversity Award from 2016-2018. It also received the UH System Board of Regents' Academic Excellence Award in 2016. The eight-week summer course, which is currently accepting applications, is designed to increase diversity among law school applicants and to provide students from low-income, first-generation, and underrepresented backgrounds an opportunity to seriously consider a legal education. The program divides students into two tracks – LSAC's Prelaw Undergraduate Scholars (PLUS) Program and Scholar II. Students in the PLUS Program start with five weeks of classroom instruction including three weeks of first, second and third-year law school class instruction taught by Law Center faculty, legal writing and research training, and trial advocacy sessions. The scholars then have a three-week internships with a variety of law firms and legal organizations in the area. Scholar II students study a comprehensive LSAT-focused curriculum to develop a strong foundation of LSAT basics, and build upon it throughout the remainder of the program. They also participate in one-on-one personal statement, diversity statement and resume workshops. Eligible Pipeline Program Scholar alumni are invited to apply to the prestigious Bridge Internship Program, where they work at a law firm for 8-10 weeks during the summer before they start law school the following semester.